Its not the image itself that is impressive, but all the science it took just to be able to get the image that is impressive. @SpankieMcGee , that image actually takes up 5 petabytes of data collected from high powered telescopes from around the world. 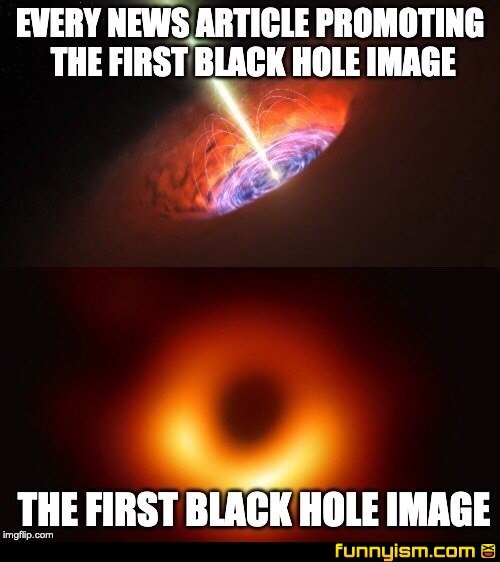 That image is absolutely groundbreaking and proves it is no longer theoretical. Every headline promoting this: "Woman! Woman woman woman woman! WOOOOMMMMAAAANNN!" Reality: there were nearly 200 people, both male and female, using eight different radio telescopes around the world to create the composite image. So are black holes in the category of Bigfoot a d Loch Ness? A lot of people believe they exist, but the only hard evidence is a blurry photo? @fettman1138, you understand though that this object is around 50 million light years away... where as big foot and nessie are meant to be maybe a couple of hundred feet. I know the difference is subtle. I hope you can appreciate it.